Windows 8 (32-bit) from Microsoft is a complete redesign of how you interact with your computer. One of the most notable features found within Windows 8 is the Start Screen. This intuitive Start Screen puts your entire computer on one screen by providing you tiles allowing you to interact with virtually every aspect of your computer from email, to chat, to applications. You can also use this same intuitive interface on a variety of devices that run Windows 8 including desktop PCs, tablets, and touch screen PCs. 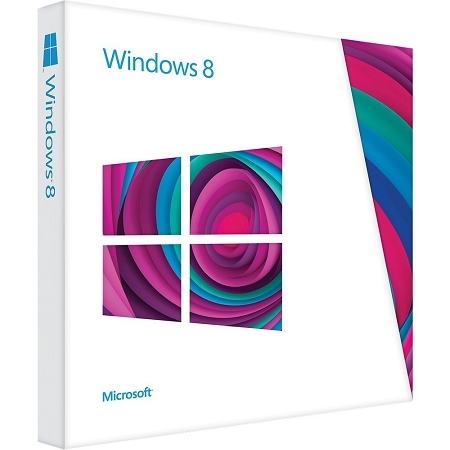 Along with Cloud connectivity, Apps help make Windows 8 stand alone as an intuitive, customizable operating system. SkyDrive, Xbox, Video, Music, Mail, Calendar, Photos, People, Messaging and Reader make up the apps that come standard with Windows 8. Each of these apps helps you to get the most out of your Windows experience. With SkyDrive, you can access files virtually anywhere on a Windows 8 device. The Xbox, Video and Music apps enhance your multimedia experience helping to streamline your music, video, and games access across multiple devices including the Xbox 360. Mail, Calendar, People, and Messaging apps keep you in touch with friends and family while keeping you on schedule. Place all of your photos in one place with the Photo app, making it possible to see your photos on any Windows 8 device. The Reader app makes it possible to read a variety of different documents in PDF, XPS, and OXPS file formats. The new Start screen has all of the information you care about in one place, such as contacts, the weather, and the next appointment on your calendar. Windows 8 is truly yours: websites, playlists, photo albums, contacts, and your favorite apps are front and center. On touch-enabled PCs, you can do the same things you could with a mouse and keyboard with touch. You can switch between apps, organize your Start screen, and pan and zoom. With the touch keyboard, you can navigate, type, and interact on the go. Because you work in different ways depending on which app you're using, Windows 8 makes it easy to use whichever method works best for you.